I remember being quite heavily into these characters when I was a kid. I especially liked the comics and the animated TV series. However I don’t recall being that fussed by the movie and don’t even think I saw them all (were there three in total?). Yet a friend recently recommended this reboot and so I thought I’d give it a go. Transformers’ Megan Fox plays plucky reporter April O’Neil who is hungry for a story that will further her career. One night she stumbles upon the latest criminal activities of The Foot Clan just as they are stopped in their tracks by a mysterious vigilante. Thinking this may be her chance April decides to track down the vigilante for herself in hopes of impressing her boss Whoopie Goldberg. Coming from Michael Bay’s Platinum Dunes this feels and looks very much like Transformers, and that’s good or bad depending on your liking of that franchise (think garish high contrast cinematography and lots of things going boom). Personally I loved the first one and this origin tale is perfectly entertaining and packed with well executed action and heaps of style. 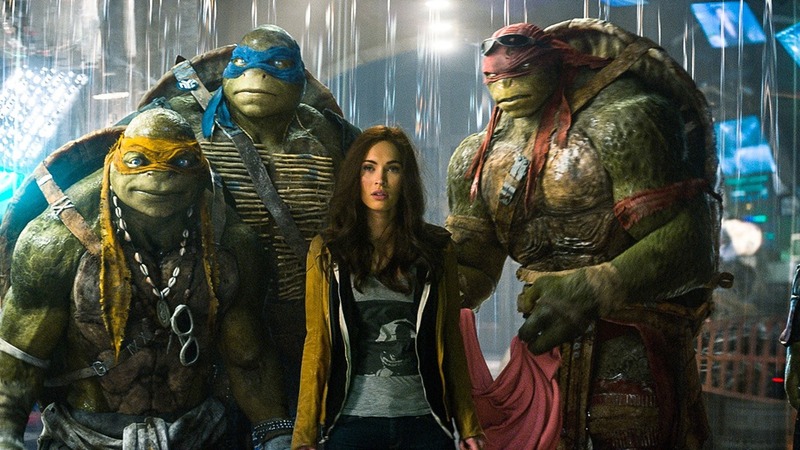 The Turtles themselves are brilliantly realised, full of personality and although entirely CGI, it’s good CGI so that’s ok. Fox also proves a little bit more than just eye candy even if her comedy sidekick / potential love interest pervs over her more than is strictly necessary. Alas, the movie’s villains are very basic and not really all that interesting or particularly explored – they’re just evil and power hungry and their big plan is nothing even remotely new. It’s also very predictable, in way too much of a rush to get to it’s conclusion and at times rather silly. I enjoyed myself however and it’s difficult to get too bogged down with it’s cliches or redundant plotting when it all looks good and has enough one liners, site gags and quality action (with great use of slow-mo) to leave your brain happily on auto-pilot. This entry was posted in Comedy Reviews, DVD, Movies, Reviews, Sci Fi / Fantasy Reviews, Thriller Reviews and tagged Comic book, Megan Fox, Michael Bay, Platinum Dunes, Teenage Mutant Ninja Turtles, Transformers, Whoopie Goldberg by Craig M. Bookmark the permalink. This did the job for an origin story. Looking forward to the sequel and the inclusion of Bebop and Rocksteady.